VLADIMIR PUTIN is reinforcing his border with North Korea by relocating troops and equipment, according to reports today. The move comes as tension remains high despite revelations that a Donald Trump naval armada is not – anyway yet – in position off the Korean peninsula. Remember, although not guaranteed, August is the month of war. Don’t forget the new Russian Armata tank can penetrate over 1 meter of steel. Russia is also not getting rid of their old tank units, but turning them into remotely controlled vehicles. Meanwhile, America sends their old ones back to the scrap heap. Russia is now on par with America in terms of military capability and technology. 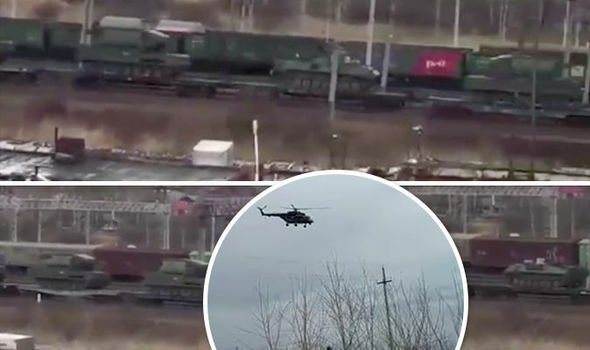 A freight train pictured carrying a convoy tanks towards the Ukrainian border looks to escalate tensions between the two sides even further. 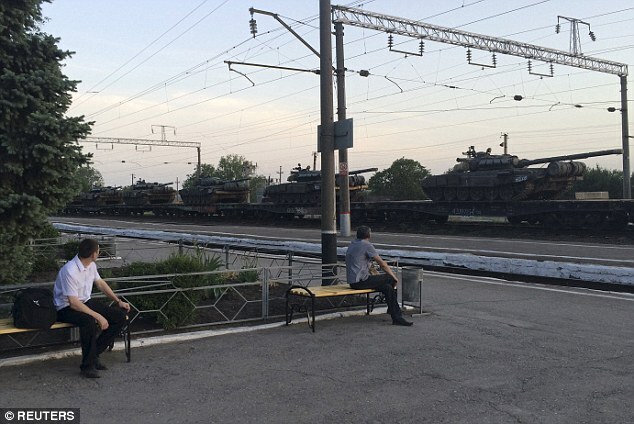 The nine tanks arrived in the southern town of Matveev Kurgan on Monday, before being driven along the streets on Tuesday. KIEV/BELGRADE/BERLIN (Own report) – A year after Berlin helped instigate the putsch in Ukraine, new information is coming to light about the February 20, 2014 Kiev Massacre. That bloodbath, of more than 50 people killed, accelerated the overthrow of President Viktor Yanukovych and was also used – even in Germany – to justify the putsch. As has now been confirmed by witnesses, armed demonstrators were the first to open fire on police, and only then, did repressive forces return fire, when they were caught in a hail of bullets while retreating. If this proves to be true, it could not have been a government-planned massacre. Furthermore, evidence indicates that also the snipers, who had shot to kill, were on the side of the government’s opponents. Today, the responsibility for that bloodbath is as unsolved as that for the deaths of more than 40 Kosovo Albanians in Račak in mid-January 1999, which the West labeled a mass execution – in spite of all contradicting evidence. Račak served as a decisive justification for the military aggression on Yugoslavia. The political and media establishments’ other forgeries and lies preceding and during the war on Yugoslavia demonstrate that manipulations, such as the ones we are currently seeing in the Ukraine conflict, are nothing new. They are rather consistent props in the German establishment’s standard repertoire for escalating conflicts. VLADIMIR PUTIN’S latest victory in Ukraine is turning into a rout. Having already induced Western leaders to endorse a peace plan that virtually guarantees continued Russian control over parts of two provinces, the Russian ruler ordered a large Ukrainian force holding Debaltseve, a key crossroads in the region, to surrender. His forces, including regular Russian army troops, then assaulted the city in brazen violation of a cease-fire. On Wednesday morning, Ukrainian forces withdrew from Debaltseve under fire, suffering a devastating defeat that will further destabilize the shaky Kiev government of Petro Poroshenko. Mr. Putin was so pleased that he indulged in some taunting of the Ukrainians. “Of course, it’s always bad to lose,” he said at a news conference Tuesday. “It’s always a hardship when you lose to yesterday’s miners or yesterday’s tractor drivers.” That was another lie, of course — the forces who seized Debaltseve were not former Ukrainian workers but Russian regulars; one Western reporter encountered soldiers who had been dispatched from Siberia. 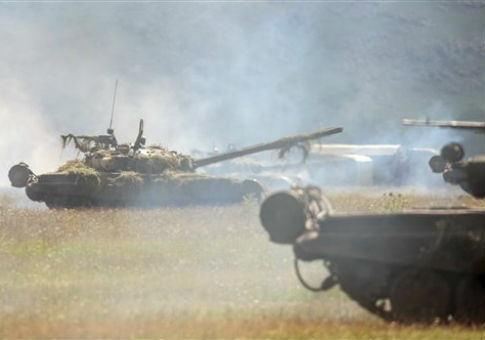 A convoy of “up to 100” tanks, armoured vehicles and rocket launchers was seen travelling on a road toward Telmanove, a town about 80 kilometres south of rebel stronghold Donetsk and 20 kilometres from the Russian border, Ukraine’s army said in a statement. The army did not give details about the personnel on board the vehicles or when the column was thought to have entered Ukraine. It looks as if we’ve moved from “years away from war” to months away, or even weeks. As mentioned in previous submissions, the Assad regime is not going to give up easy and is going to bring down the entire Middle East with him should he realize he has only moments left of being in power. The entire region is at a critical boiling point. President Barack Obama’s decision to send some light weapons to Syrian rebels may be too little and too late to thwart a regime offensive to retake Aleppo, the nation’s largest city and commercial capital. Regime forces supported by fighters from the Iranian-backed Lebanese Shiite group Hezbollah have moved north after defeating rebels in al-Qusair, a setback that triggered concern in Washington that Iran and its Lebanese ally are tipping the balance in favor of Syrian leader Bashar al-Assad.